This is one of the most romantic spreads of this Black Creek Pioneer Village wedding album. I took the two photos composing this album towards the end of the big day, at sunset time. As a particular photography technique, I shot against the Sun allowing a bit of light to enter the lens to create a flare. Also, the dust particles floating in the air, give the pictures a dreamy look. The golden light that occurs naturally during the golden hour makes the wedding photos taken at this time of the day look gorgeous. Both images on this album spread were taken if you hundred feats from the venue during the reception when the guests enjoyed their dinner. The left photo features the groom carrying the bride in his arms. Both subjects are placed on the left of the frame. Their foreheads are touching as if they're almost about to kiss, which gives this photo a romantic feel. There's no one else in this photo but the bride and groom. The rays of the sun are casting a golden light upon them which separates a couple from the background. The picture of the right perfectly complements the wedding photos. It shows the couple, at the right end of the frame, leaving a negative space on the on the right. As a side note, many couples are too tired towards the end of the wedding day and wedding photography is the last thing on their mind. However, during the reception I begged them to give me some time to take some bride and groom portraits. The placement of the subject according to the rule of thirds gives the pictures a professional look. 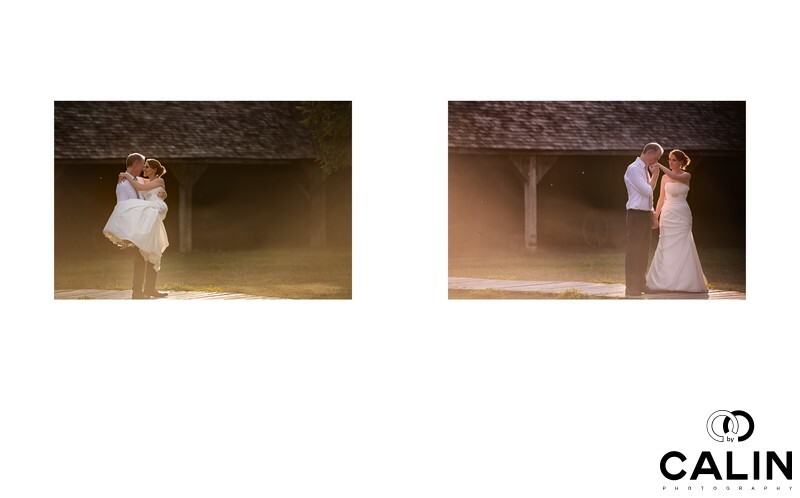 Even more, the way the subject are placed on the left of the frame in the first image in on the right of the frame in the second wedding photo gives this album spread balance.